Was Ron Jaworski The Puppetmaster Behind Penn State's Odd Coaching Hire? Several football insiders insist Penn State could have hired a proven college coach. For reasons which have not been publicly articulated, the search instead veered toward largely anonymous NFL assistants. Word from some is that "Monday Night Football" analyst Ron Jaworski is a friend of one of the search committee members and became involved in the search, helping steer it that way. Like, what? Ron Jaworski did not go to Penn State. He's not from Pennsylvania. His business is based in New Jersey. He has no apparent ties to the school. His connection—his "friend" on the search committee—is Ira Lubert, a venture capitalist in Philly and a Penn State alum. He is an investor in many of Jaworski's businesses, including his golf courses and a Holiday Inn in Philadelphia. In 1994, the pair tried to buy a chunk of the Philadelphia Eagles from Jeffrey Lurie. (Didn't happen.) Lubert and Jaworski play in golf tournaments together. They make a nice pair: Jaworski's the respected ex-jock with the high-profile ESPN gig, and Lubert's the ex-Penn State wrestler with all the money. The trick in this case will be to find someone who really wants to be Penn State's football coach amid an unprecedented roiling sea of uncertainty. And then, maybe to form a partnership of wealthy PSU alums to help bankroll a salary package that will get what's certain to be a strapped university over the top in the crazy arms race that is major college football. That's the only way it appears a top-level outside hire will come to Penn State. Because the university not only must budget for tens of millions in possible civil settlements but also severe proposed cuts in future commonwealth support. As one well-placed alum told me, paying top dollar for a football coach "is not in Penn State's budget. Nor is it in its mentality." Bear with my conspiracy theory for a moment: Lubert sees an opening—he can seize control of Penn State's football program because, without his money, they can't hire anyone worthwhile. But presumably he wants someone who will kowtow even more than usual. So he realizes he needs to find someone who looks good on paper—a New England Patriots offensive coordinator, for example, even though the last two guys who held that job sucked as head coaches—and will command top dollar because of that. But he can't actually be established enough that he'd be able to stand up to Lubert. How does Jaworski fit into this? Well, he gets face-time with "largely anonymous NFL assistant coaches" every week in Monday Night Football production meetings. He could prod them privately for their interest in the gig, and whether they'd put up with Lubert's future hectoring. If they assented, he could recommend them to Lubert as real candidates. And from there we get Bill O'Brien. 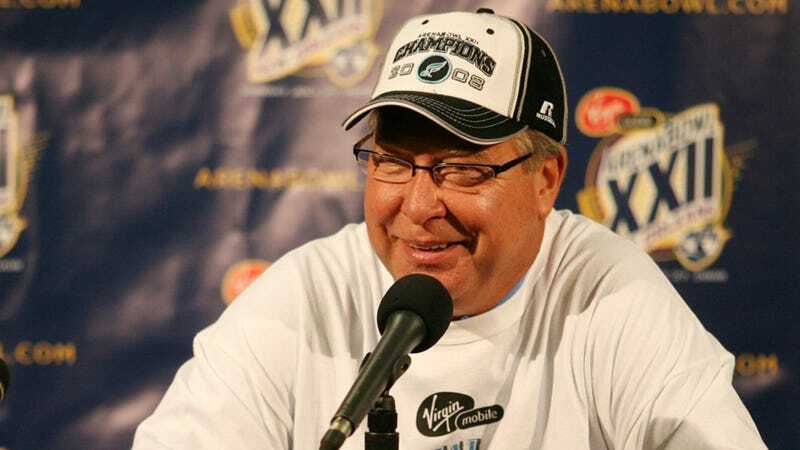 Or maybe Ron Jaworski just knows football and wants Penn State to succeed. Who knows?